For the treatment and control of adult and immature roundworms including inhibited Ostertagia and Haemonchus contortus, Nematodirus, lungworms and nasal bots of sheep. A pale yellow free-flowing aqueous solution containing 0.08% w/v ivermectin for oral administration. Contains benzyl alcohol as preservative. For the treatment and control of gastro-intestinal nematodes, lungworms and nasal bots of sheep. ORAMEC DRENCH at the recommended dose rate of 200 micrograms ivermectin per kg bodyweight provides effective control against the following parasites of sheep. Gastro-intestinal roundworms (adult and immature): Haemonchus contortus, Ostertagia circumcincta, Trichostrongylus spp., Cooperia spp., Nematodirus spp. including N. battus, Strongyloides papillosus, Oesophagostomum spp. and adult Chabertia ovina. Inhibited larval stages and benzimidazole-resistant strains of Haemonchus contortus and Ostertagia circumcincta are also controlled. Lungworms (adult and immature): Dictyocaulus filaria. Nasal bot (all larval stages): Oestrus ovis. 2.5 ml per 10 kg bodyweight (corresponding to the recommended dose rate of 200 micrograms ivermectin per kg bodyweight), administered orally with a dosing gun. The dosing gun should be calibrated sufficiently accurately to ensure precise dosing of young sheep. Give as an oral drench. Resistance to macrocyclic lactones (which includes ivermectin) has been reported in Teladorsagia spp. in sheep within the EU. Therefore, the use of this product should be based on local (regional, farm) epidemiological information about susceptibility of nematodes and recommendations on how to limit further selection for resistance to anthelmintics. In case of accidental spillage onto the skin or eyes, wash the affected area with clean running water immediately. Seek medical attention if irritation persists. 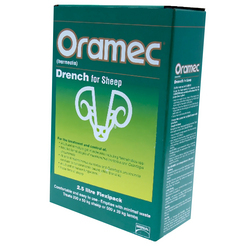 ORAMEC DRENCH has been formulated specifically for use in sheep. It should not be used in other species, as severe adverse reactions, including fatalities in dogs, may occur. Sheep may be slaughtered for human consumption only from 6 days after the last treatment. Do not store above 25°C. Protect from direct sunlight. 1, 2.5 and 5 litre containers. Some animals may cough slightly immediately after treatment. This passing response is of no consequence. ORAMEC DRENCH can be administered to ewes at any stage of pregnancy. ORAMEC DRENCH will not affect the fertility of breeding ewes and rams and can be given to all ages of animals including young lambs. ORAMEC DRENCH has demonstrated a wide safety margin at the recommended dose level. ORAMEC DRENCH may be used in sheep of all ages. During a study to assess toxicological effects only mild incoordination and depression were observed at 20 x the recommended dose level (4 mg ivermectin per kg bodyweight administered by stomach tube). At 40 x the recommended dose level (8 mg ivermectin per kg bodyweight administered by stomach tube) acute symptoms (ataxia, staggering gait, incoordination and depression) were observed. Within 24 hours nearly all animals appeared normal and within 3 days all animals appeared clinically normal. No antidote has been identified. However, symptomatic treatment may be beneficial. Ivermectin is a member of the macrocyclic lactone class of endectocides. Below are some recent questions we've received regarding Wormers Oramec Drench For Sheep, including answers from our team. How long does oramec cover sheep on the different worm groups? Like the majority of parasiticides, ORAMEC does not have a long duration of action. The product is effective against the lifecycle stages listed below at the time of administration. Inhibited larval stages, benzimidazole resistant strains of H. contortus and O. circumcincta are also controlled. Oramec is often used for goats but it is licensed only for sheep so you would need a prescription to buy it for use in goats. Your own vet will be able to advise you on an appropriate dose rate for your goats. However for sheep the dose rate is 200 micrograms per kg where the recommended dose rate for goats is double at 400 micrograms per kg bodyweight which works out at 5mls per 10kg bodyweight. What is the expiry date for a 1 litre bottle of wormer? This generally varies between 6 to 24 months but is most often towards the middle of that range. We do not have any in stock today so I cannot check now, but we can get it in every day. If you need a particularly long date you can stipulate that when you place the order and we will check this for you before we send it. Best to make the order by telephone in this case.